Batty's a red-eyed, black vampire bat, just hanging out (all friendly-like with his fangs bared expectantly! )waiting for the trick-or-treat crowd! Includes color graph with symbols. Size 11 Delica bead colors numbers and quantities are included (5 colors). Stitch instructions and Word Chart are NOT included. 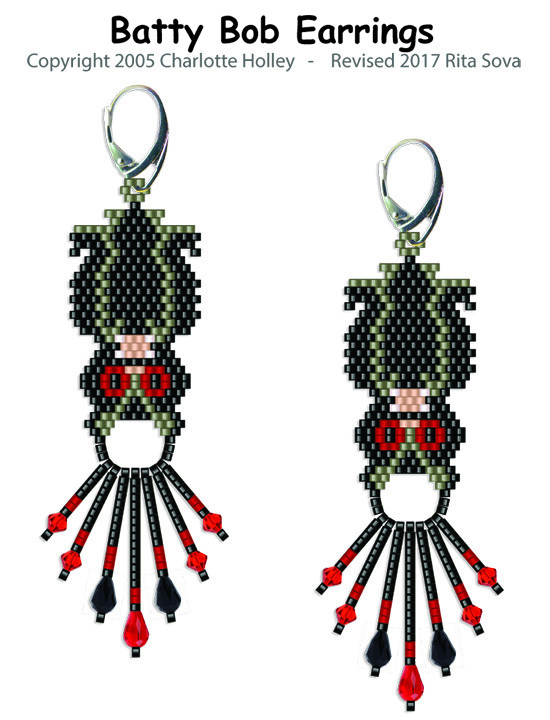 Approx size Earring: 13 beads W x 34 beads H (.93" x 1.8") without fringe. Beads: Size 11 Delica, 4 or 5mm crystal bicones and 10.5 x 7mm fire polish teardrops.